PRINCETON, N.J.–The five-decades-long Colombian conflict weakened government institutions and left millions displaced. With a new president at the helm, many wonder about the future of the country. A paper published in the American Political Science Review shows how armed groups in Colombia — both left-wing guerilla forces and right-wing paramilitary groups — were able to shape policy outcomes by influencing local officials who carried out the groups' policy preferences. This blocked the state from developing effective government institutions. The analysis shows strong connections between the presence of illegal armed groups and differences in property rights and taxes. Overall, the higher the level of violence by an armed group in a particular region, the more taxes and property rights are shifted in the direction of the group's preferences and the civilian groups they favor. The researchers urge Colombian policymakers to pay attention to land development and taxation in areas previously occupied by these groups. "Broadly speaking, our findings reveal the drawbacks to fiscal decentralization in areas experiencing ongoing conflict," said study co-author Jacob N. Shapiro, professor of politics and international affairs at Princeton University's Woodrow Wilson School of Public and International Affairs. "To restore the state's control over local tax institutions and property rights, the central state may have to limit municipal autonomy." Shapiro conducted the study with Rafael Ch of New York University, Abbey Steele of the University of Amsterdam and Juan F. Vargas of the Universidad del Rosario. They sought to better understand the effects of internal wars on state-building and fiscal capacity by looking at property and tax institutions. Colombia is an ideal case to understand how internal wars facilitate institutional capture for many reasons. Beyond the dynamics of its civil war, Colombia's local governments have quite a bit of control over property and tax institutions. Mayors are in charge of managing and updating the land registry, and city council can decide tax rates, tax collection mechanisms, enforcements and fines. As the civil war in Colombia intensified over time, these municipalities became attractive targets for armed groups to further their interests. "While in theory local autonomy could allow for more efficient tailored policies, in reality they are more prone to capture by private groups with vested interests," Ch said. 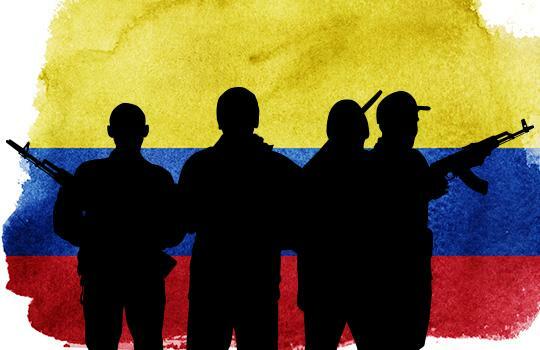 To understand the power of these rogue armed groups, the researchers combined administrative information on tax revenues and property rights with territorial control and violent activity in Colombia. They then tested these implications across four-time periods with different trends in armed group influence: the period of dramatic FARC growth from 1988 to 1996; the expansion of right-wing paramilitaries from 1997 to 2002; the paramilitary demobilization from 2003 to 2006; and the steady re-establishment of state control from 2007-2010. During each period both paramilitary and guerilla armed forces — particularly the Revolutionary Armed Forces of Colombia – People's Army, known as FARC — intervened with land grabbing, property rights and taxes. Right-wing paramilitary groups, founded by large landowners and drug traffickers, frequently colluded with state forces but were independent of them. They purchased tracts of land, displacing peasants. Areas where they dominated violence reported higher tax receipts and more land formalization — mapping out and establishing legal title over more plots of land. Left-wing insurgents skewed toward equitable land distribution, which they acquired through land invasions that peasants and workers occupied. These land grabs were not formalized legally, and private property rights were not secured. These areas reported lower tax receipts. In the paper, the researchers explain that these groups most likely influenced property rights and taxes through intimidation. It is possible that both sides could have helped elect candidates who would carry out their preferred policies. However, the researchers found the relationship between paramilitary or guerilla violence and the election of candidates from former President Álvaro Uribe's right-wing political party coalition to be quite small. And while violence itself could have caused reductions in tax revenues by hurting the economy and property values, that would imply reduced tax receipts regardless of who dominated violence, which was not the case. The paper therefore points to intimidation and similar forms of political influence as the explanation most consistent with the evidence. "In terms of policy, the state should focus on land redistribution and progressive taxation measures in areas where paramilitaries were dominant. In areas where insurgents were dominant, attention to land formalization and tax collection should be prioritized," Shapiro said. The paper, "Endogenous Taxation in Ongoing Internal Conflict," first appeared online Aug. 3 in the American Political Science Review.